This agreement documents the terms of a personal loan and can be relied on in a court or tribunal, to evidence the loan, should things not work out as planned. what happen's if a party does not fulfil their responsibilities. This document cannot be used for transactions for which the National Credit Code applies: that is, where the lender provides credit as part of, or incidental to, their business (among other things). For more information about whether the National Credit Code applies to you, refer to ASIC’s information page here. If security is being taken for a personal loan, refer to the Secured Loan (not suitable where the security is land). This specialised Excell spreadsheet does all the calculating for you. Just input the details of the loan: the amount, term, number of repayments, interest rate and it crunches the numbers for you. 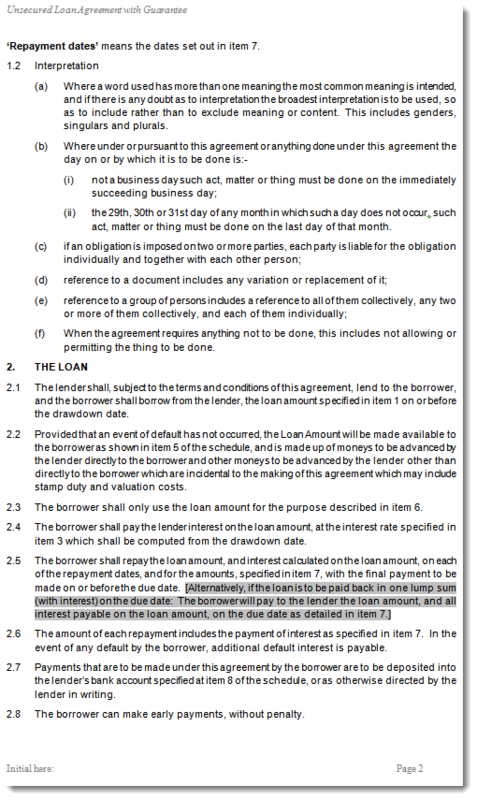 You can then print this document and attach to the loan agreement. Sample Screenshot of Loan Payment Plan. Enter the loan details and it will perform the necessary calculations. Click to enlarge. Your professionally drafted, easy to use Unsecured Loan agreement with Guarantee is available for immediate download. The document comes to you as a Microsoft Word template that can be used as often as you like. Simply insert the correct information in the appropriate field and tab to the next. Now print your professional agreement!